Are you annoyed by song lyrics that do not obey the rules of grammar? Do you correct them as you sing along? To mark the inclusion of English Grammar Today on Cambridge Dictionaries Online, we thought we’d count down some of the worst offences against the rules of grammar committed by songwriters, either deliberately, or without knowing. 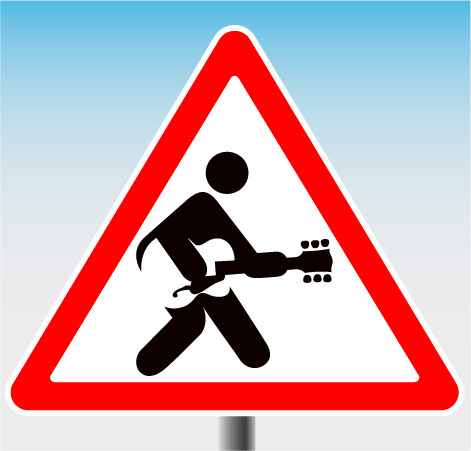 Rock’n’roll has always been drawn to the rebellious side of life, so it’s little surprise that a large number of songs feature non-standard or slang grammar in their lyrics: double negatives such as ‘We Don’t Need No Education’ (‘Another Brick In The Wall’ by Pink Floyd) and ‘I Can’t Get No Satisfaction’ (‘Satisfaction‘ by The Rolling Stones). Some musicians go even further, adding in the equally non-standard ‘ain’t’, as in ‘Ain’t No Sunshine’ by Bill Withers, and ‘You Ain’t Nothing But a Hound Dog’ (‘Hound Dog‘ by Elvis Presley). Perhaps the best example of deliberate breaking of the rules is in Louis Jordan’s ‘Is You Is Or Is You Ain’t My Baby?’, guaranteed to send your Word grammar-checker haywire. The non-standard seems almost standard in rock music. Moving on to a different type of error, what was Bob Dylan thinking in the song, ‘Lay Lady Lay’ when he invited his lady to ‘lay across’ his ‘big brass bed’? Surely Bob Dylan knew the rule? You lie on a surface. (intransitive) You lay a person or a thing on a surface. (transitive) Or perhaps not? Eric Clapton also ignored – or was not aware of – this grammar rule while co-writing his 1977 song, ‘Lay Down Sally’. And if this ever-changing world in which we live in / Makes you give in and cry / Say live and let die. The phrase ‘in which we live in’, should, of course, be either ‘in which we live’, or ‘which we live in’ – you can’t have ‘in’ in both positions. But then this wouldn’t have scanned (= had the right number of syllables for the line). So did the McCartneys add the extra ‘in’ thinking no one would notice? Were they even aware of their mistake? Did they, in fact, ever write this incorrect lyric? Asked about the line many years later, McCartney said he couldn’t quite remember what he’d written, but added that he thought it was probably, ‘in which we’re livin’’, which is, of course, perfectly correct. We’ll let you be the judge. Oh Alicia, relative clauses can be tricky things, but ‘where dreams are made of’? It should be either ‘which dreams are made of’ or ‘where dreams are made’. But maybe ‘which dreams’, with the consonant sounds of ‘ch’ followed by ‘d’, doesn’t ‘flow’ as nicely when sung, and the preposition ‘of’ at the end of the line is needed to make it scan. Do you know any ungrammatical, or otherwise nonsensical, lyrics that make you see red? Let us know? The Brooklyn Bridge, led by Johnny Maestro, did a song called The Worst That Could Happen. In it, Maestro sings “if he really loves you more than me”. That really makes me cringe. Actually, the issue here is not grammar but meaning. The sentence as written means “if he really loves you more than [he loves] me.” Replacing “me” with “I” involves a different omitted verb and a different meaning: “If he really loves you more than I [love you].” I don’t know the song, so I can’t tell which is correct. To have been grammatically correct, it should have been “I”. That is was written “me” completely changed the meaning of the sentence. This is terribe for a non-native English speaking person. Imagine when I listen to the radio and hear those sentences that make me question my English language knowledge (“My baby don’t care for me”. Don’t? Doesn’t?). I hope you wrote this tongue in cheek. These are after all only song lyrics, allowing for ‘poetic licence’. I believe that the divide between poetic license and grammatical error is a very, very thin line, and should be walked with care. For instance, the lay-lie confusion is very common (not only among song writers, alas! also authors have been known to incur in it) and I don’t think it has anything to do with poetic license. I once commented on such a mistake in the lyrics of a song that had to do with language, no less, and got my head bashed in by other commenters, brandishing the poetic license bat, so now I mostly abstain from pointing these things out. Sometimes lyrics wilfully reflect a certain manner of speech (“Aint misbehavin’ ” would be another such case) and there, I feel that no objections should be raised, other than tongue-in-cheek, as is the case of the examples mentioned under No. 5 of the above list. In any case, thank you for an entertaining post. Bob Dylan is American and in American English lay is used as he uses it in the song. It is not a matter of incorrectness. The double negative is used deliberately and effectively in the two songs cited; this is clearly a case of poetic licence, Some kinds of double negative are acceptable by the way, e.g. “it’s not unusual” which is also a song title, and funnily enough the song does contain a clanger when it goes on to state that “it’s not unusual to be loved by anyone”. Should be “someone”. Now there is a good example of a grammatical train wreck! What about Bob Dylan’s famous song.. So if you listen, it’s “oh” and not “of,” which doesn’t stop hundreds of lyrics sites from misquoting. Also never stopped me from signing it wrong anyway. An English Teacher was educating her class on the subject of double negatives. When she said there was no such thing as a double positive, some smartass at the back of the class said, “Yeah, Right”! Imany’s “Don’t be so shy” is partly embarrassing even to me, as a non native speaker (Swede)..